Solonetzic soils have a subsurface soil horizon layer characterized by a higher level of sodium (Na) and often an accumulation of clay. This hardpan layer makes soil management and crop production a challenge. 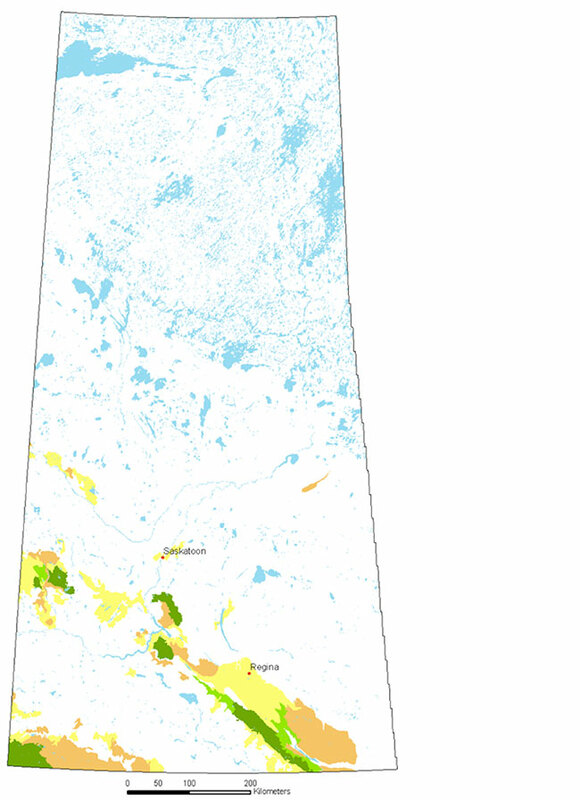 These soils occur most commonly in Alberta and Saskatchewan (Figures 1 and 2), and less commonly in Manitoba. Solonetzic soils have developed on parent material containing sodium salts that originated from marine shales or have developed on lower relief landscapes that are affected by ground water discharge that is higher in sodium. Typically, the hardpan “B” soil horizon, or subsoil, varies from five to 30 centimetres (two to 12 inches) below the surface soil. The combination of high sodium and clay cause the subsoil, where most roots live, to be extremely hard when dry. When wet, the subsoil swells to a very sticky mass with very low water permeability. Years of swelling and shrinking of clay, coupled with the high sodium, causes the subsoil to develop into a hard columnar structure. These physical characteristics restrict root and water penetration into the subsoil. This limits the rooting ability of crops into the subsoil and restricts the plants’ ability to take up water and nutrients, affecting crop yields. Solonetzic soils are often intermixed with normally developed soils, resulting in a wavy crop growth pattern. A soil is considered Solonetzic when it has a Bn soil horizon, with the “n” indicating a high sodium content. When Solonetzic soils form, there tends to be downward movement of clay from the surface soil (A horizon) into the B horizon, forming a Bnt horizon. The “n” indicates an accumulation of sodium and “t” indicates an accumulation of clay. The B soil horizon commonly overlies a C subsoil horizon with sodium salts, gypsum (calcium sulphate) and/or lime (calcium carbonates). A leached Ae horizon occurs within the surface soil when clay has moved downward from the A horizon and the “e” indicates an eluviated layer. Since the 1950s, a range of physical and chemical practices have been tried with varying degrees of success. Deep plowing and deep ripping have been tried alone and in conjunction with amendments such as lime or gypsum. Limited water percolation into subsoil of Solonetzic soils is a major concern. Deep tillage to break up the hard B horizon has been used to increase water penetration and improve moisture storage. However, the success is short term as the sodium and clay enriched hardpan often reforms. Generally, success has been better in higher precipitation areas. When Solonetzic soils are also saline (high in soluble salts), deep tillage is not recommended and may even encourage further soil salinization. Reclamation and improvement of Solonetzic soils can be expensive. The Solonetz soil group is the most challenging to reclaim and manage. Solonetz soils in native grass, particularly in the drier regions of the prairies, are often best left in their natural condition and used for carefully managed livestock grazing. Reclamation of Solodized Solonetz and Solod soil Great Groups have better potential for successful reclamation. Deep plowing has been used with reasonable success on suitable Solonetzic soils. Deep plowing is used to bring up C horizon soil that is rich in calcium in the forms of lime and gypsum, to intermix with the Bnt hardpan. When this is done successfully, it allows calcium to replace sodium on exchange sites on the clay particles to improve the soil structure and prevent reformation of the hardpan. Over time the displaced sodium will leach out of the B horizon. To be successful, the lime/gypsum layer must be within plowing depth, and the soil must be dry to ensure good soil shattering and intermixing of the B and C horizons. Often the A horizon of Solonetzic soil is acidic and when lime from the C horizon is mixed with the top soil, this can neutralize the soil pH to also provide soil improvement. However, the quality of the top soil is degraded in the mixing process and the soil organic matter content is greatly diluted. This can leave the surface soil rough, lumpy and will greatly reduce seedbed quality. The year after deep plowing, putting a field into forage for three to five years will allow time for the calcium and sodium exchange process to take place to improve B horizon quality and will help to improve surface soil quality. Deep ripping, also referred to as subsoiling, has been used as an alternative to deep plowing. To be effective, the soil will have a Bnt hardpan but with lower to moderate levels of sodium. The soil must be dry to ensure good fracturing of the hardpan. Unfortunately, ripping does not accomplish intermixing of the B and C soil horizons. Soil improvement and increased crop yields are mostly due to the physical shattering of the B horizon to improve water percolation and plant root penetration through the B horizon. When soil sodium levels are lower, the hardpan may not reform. When soil sodium levels are moderate, redevelopment of the hardpan may occur over time. Ripping is less successful when the B horizon is moist or wet at the time of ripping, or if soil sodium levels are moderate or high. Before undertaking deep plowing or deep ripping of Solonetzic soils, farmers should consult with a well-qualified and experienced soil specialist to determine if their soils have suitable characteristics for successful reclamation. Utility companies should be contacted to locate buried lines prior to tilling deeper than 30 centimetres (12 inches). The Canadian System of Soil Classification has divided the Solonetzic soil order into four Great Groups: Solonetz, Solodized Solonetz, Solod and Vertic Solonetz. Solonetz soil is less common on the Prairies and has formed on soils with high levels of sodium. The change between the topsoil and subsoil is more abrupt. Solodized Solonetz soil is more common on the Prairies. This soil has an Ae horizon, or surface soil, greater than two centimetres thick. Leaching has developed an acidic ashy-white Ae soil horizon above the hardpan from which clay and organic matter have been leached. Solod soil develops with continued leaching of sodium and degradation of columnar tops. These soils often have an acidic topsoil and a subsoil that breaks apart more readily. Of all the Solonetzic soil types, Solod soils have the best potential for improvement and annual crop production. With continued breakdown of the Bnt horizon and leaching of sodium from the B horizon, the soil degrades to become a Solodic Chernozem soil, with some of the physical features of a Solonetzic soil but without the high level of sodium. Vertic Solonetz soil occurs on heavy clay soils and has a Bn or Bnt horizon. Why is it good to have the ground covered by snow? Compaction: Is it really a problem?